Clients can expect more if they work to avoid complacency, according to the fourth major finding in AdvanceLaw’s GC Thought Leaders Experiment. 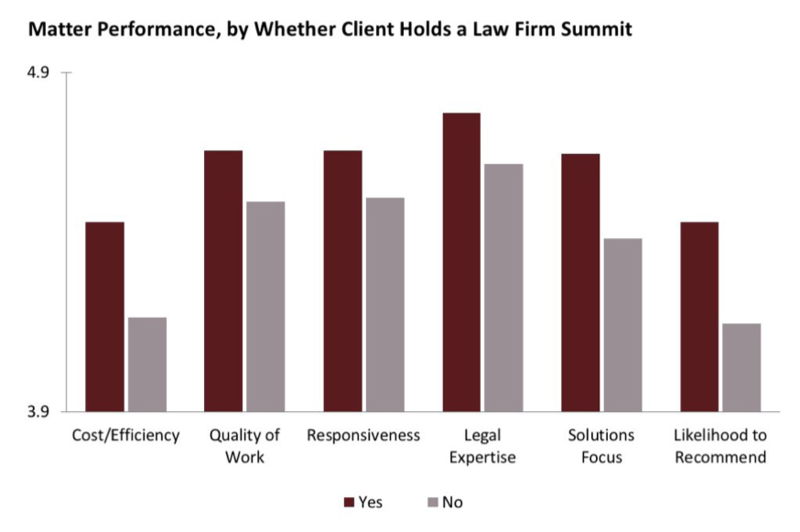 As noted in Panels, Part I, law firms on a panel don’t outperform nonpanel firms (the bar chart above), and clients with panels don’t achieve better results than clients without panels. This is stunning to us given how much effort general counsel and their teams put into panels. In this article, we ask whether the issue isn’t simply panel creation, but panel management. Our conclusion, based on data across 28 clients and 1,400 legal matters, is that panels are not managed well, despite clients’ best intentions. Overall, clients tend to breathe a sigh of relief once panels are formed, rather than strive to be a client of choice for their law firms. Being a client of choice refers to the fact that star lawyers at most firms are busy serving many clients, and some clients are far more successful at getting the mindshare of these stars on their work. We should note that it’s not always about spend—as the data in “Panels, Part I” shows, simply sending more work to a firm doesn’t generate better results. Our view is that clients need to make the law firm (and the lawyers handling the work) feel valued, while at the same time injecting a bit of healthy competition so they maintain a sharp edge. When we looked across dozens of management practices, we found that clients who achieve this balance—strong enfranchisement and healthy competition—fare much better than their peers. Consistent with this new data, when firms are brought in to bond with the in-house team and learn from senior business clients, they will be more knowledgeable about the business and more enfranchised. Summits are a powerful way to become a given firm’s client of choice and win the war for talent within that firm. Yet few clients hold summits. We understand why: they take time and energy. But the returns are incredibly strong. In the words of one of our GCs, law firm summits are “the most difficult, yet most rewarding” thing he does. And it’s not just summits; anything that clients can do to make law firms feel less like vendors or widget manufacturers is a good thing. The way an RFP is worded matters a lot. Whether firms are called vendors or strategic partners matters, too. We find many clients inadvertently alienate the very law firms they’re trying to bring closer, and most law firms are too polite (or too scared) to mention this, except in passing. These gaps are not statistically significant, but the overall pattern is interesting and merits further exploration. It is also notable that the largest effects of bids are not necessarily on cost (which is typically the reason for bids), but on expertise, quality and responsiveness. Competitive bids can certainly backfire and disenfranchise law firms: many clients ask for too much detail in a perfunctory manner, and they reach out to too many firms. But when used sparingly and designed thoughtfully, they serve as a reminder that being a key firm is not a lock on receiving the largest and most important matters and portfolios. Bids can also show firms on the panel that haven’t yet been retained much that they are still in contention for major work. All of this relates to perhaps the biggest example of panel mismanagement. Some firms on a panel seem to automatically get all the plum work (thereby becoming complacent), and other firms on the panel receive very little work (thereby becoming demotivated). In other words, panels can make every firm underperform, either through too much or too little work. This is because in-house lawyers tend to retain the same partners and firms they used even before they made it on the panel, rather than looking for opportunities to retain new counsel on the panel. It’s understandable: in-house lawyers have limited time to identify new talent and prefer a known quantity. While competitive bids (used carefully and well) can help offset this issue, something else needs to be done to spread the work. This is why we often help GCs create controls to ensure panel firms are enfranchised (as outlined in this article on DXC’s panel). One such control is a triage mechanism to help in-house lawyers find counsel within the panel that has the best expertise. Another control is to arm in-house lawyers with performance information so they have greater confidence trying out new lawyers and firms on the panel. The charts above take a closer look at the performance of law firms for their clients over time. On the left, we see a “post-honeymoon” performance dip when looking at clients that do not regularly share qualitative feedback. The chart on the right shows what happens when clients do share such feedback: the performance dip is largely reversed. One reason for this is that firms learn and improve. But, just as likely, clients sharing feedback are simultaneously enfranchising firms and creating healthy competition. The enfranchisement comes from clients spending time discussing the client-firm relationship—a signal to the firm of the importance of the relationship. The competition comes from firms knowing they are being assessed, as are the client’s other firms; it’s a not-so-subtle signal that performance is a prerequisite to continuing to earn the client’s work. Beyond this, and based on our experience, clients sharing performance scorecards with firms—showing how the firm stacks up relative to others—is an especially powerful tool to focus firms on service excellence. It is a shift from client micromanagement to firm accountability, something clients and firms both appreciate. Yet a minority of clients regularly share scorecards or conduct qualitative reviews of their panel firms. It’s admittedly simple, but few clients regularly engage in these practices. Note that the best outside counsel enjoy working with these clients the most: these lawyers are rewarded for strong performance with more legal work. And the return on investment to clients is impressive—as noted in each of the charts above, the benefits relate not only to quality but also to cost. And this is something we’ve found at AdvanceLaw in general as we help our GCs find and retain counsel: partners receiving the best feedback on quality, expertise and responsiveness typically earn the best feedback on efficiency. Clients can, through the right practices, have their cake and eat it, too.